Polish your favorite pipe and bring it to the meeting. Show and tell is always welcome, and every pipe has a great story behind it – share yours. …when they used to tell me I would shorten my life ten years by smoking, they little knew the devotee they were wasting their puerile word upon — they little knew how trivial and valueless I would regard a decade that had no smoking in it! So once again we gathered at Telford’s for the monthly Golden Gate Pipe Club meeting. Such a gathering is especially welcome in darkest February to cheer us up in the midst of the harsh Californian winter when temperatures dip below 40F and even the sun is on some days obscured by clouds. The evening was packed full of triple-barreled fun as we had a Savinelli trunk show, a slow smoking contest and, best of all, the indefatigable Dr Axelrod unveiling his latest acquisitions. Giacomo Carlesi, the Export Manager from Savinelli, regaled us with a fine showing of his company’s products. He is very personable and skillfully answered all the questions we peppered him with throughout the evening. For example, when asked by a member where their briar came from, Giacomo replied most was supplied by families in Calabria known to the Savinellis for over a century. The blocks are aged anywhere from one to ten years. Giacomo set up a trunk show on some tables, and we admired the many pipes as well as lighters and cigars on display. The above shape, called a “fan”, shows a wonderful grain. Savinelli also sponsored a slow smoking contest. We each were gifted a little Savinelli pipe called a “Spring” and two grams of their “Aroma” tobacco for the competition, as well as a tin to take home. As this was our first ever slow smoking contest, Giacomo entertained us with stories of events he had seen. Apparently, the Europeans are very competitive about such matters, and none more so than the Swiss, who tease out each type of tobacco in their sample and layer them separately in their bowl. After much debate on the rules (two matches only) and many false starts, the competition officially began and a deadly silence fell over the table. After several minutes of intense focus and very careful sipping on the baccy, my mind began to drift and I wandered over to the Savinelli trunk show to drool over all the excellent pipes. They enthralled me so much that many more minutes elapsed before I realised I had forgotten to draw on my pipe which was now stone cold. I shrugged my shoulders, laughed and went on to fire up another pipe. After 34 minutes, Phil Wells noticed he was the last man standing (puffing?) as everybody else’s pipe was extinct. 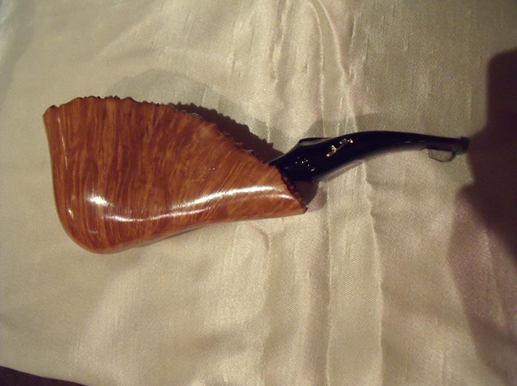 So he let his die out and thus won the prize: a handsome Savinelli lighter. Bearing in mind that some hyper-competitive people can smoke for over two hours, we obviously broke no records. Ma che importanza ha? We all had great fun. Once again, our Dutch pipe smoker and Slayer of Clan tobacco, made an appearance. The third portion of our show consisted of admiring our president Dr Axelrod’s latest acquisitions. As an admirer of Savinelli’s craft, Mike displayed an Autograph set in its own carrying case with the company logo. Made in 1970, he believes it may be one of a kind. All unsmoked, the grain patterns are exquisite and, if today’s classification were used, these would most likely be double 0 and triple 0 specimens. Next he passed around this stunning Autograph which he graciously allowed me to smoke. It is a brilliant work of art. By way of contrast, Mike passed around a JT Cooke blast which he acquired a short while ago. That bulls-eye pattern is phenomenal. Norman Rockwell, the prolific painter, illustrator and pipe smoker, was the object of a presentation which our club historian Dr Miller made last year. Mike Axelrod, in addition to amassing interesting pipes, is also one of the better-known collectors of American photography and is bestowing elements of his vast holdings to various museums and foundations. When an original photograph and a letter by Rockwell recently came up for sale, he purchased them. The photo shows Rockwell with his familiar Dunhill, and the letter from him acknowledges his election to the Pipe Smoker’s Hall of Fame in 1971. Many, many thanks to Giacomo, the Savinelli company and Telford’s for sponsoring such a fine evening, and to Dr Axelrod for sharing with us his most recent finds. After each meeting, I ask myself: how can it possibly get any better? Then, next month, it does just that.